help revise statement on Developmentally Appropriate Practices (DAP) in Early Childhood Programs. introduced the four Developmental Stages of Teaching and co- directed the project approach for learning. Previous postQuotes That Fuel Our Drive!!! Frenchette, I really admire your second quote from Lilian Katz. It is absolutely true that sometimes it takes more that praising a child because some will look past it. Other children would rather prefer actual love and support to let them know you care and are concerned of their well-being. I find the first quote is where school systems go wrong. They spend all this time requiring high qualities in teachers and then tell them how they will teach every part of the day and what resources they will use. This is a major advantage of teaching in pre-school. We do have a aligned curriculum to the K-12 school in our district, however the way we choose to support student learning is still in our quality hands. Lets give our teachers a chance to use their amazing skills, knowledge, and good judgement! You are so right. I love being involved in educating at the early childhood level. While my center has a curriculum that aligns with our school system, my teachers are encouraged to be as creative as they want to be and to tweak the curriculum to meet the needs of the children. This creates a balance. I am going to piggy back off your statement. You are so right about the school systems. They make becoming a teacher so tough, because of the requirements. As a paraprofessional I get to see teaching through different eyes. They require so much paperwork and they take the excitement and sound judgment away from the teachers, because they give them step by step detail and no creativity is involved. Let teachers teach. 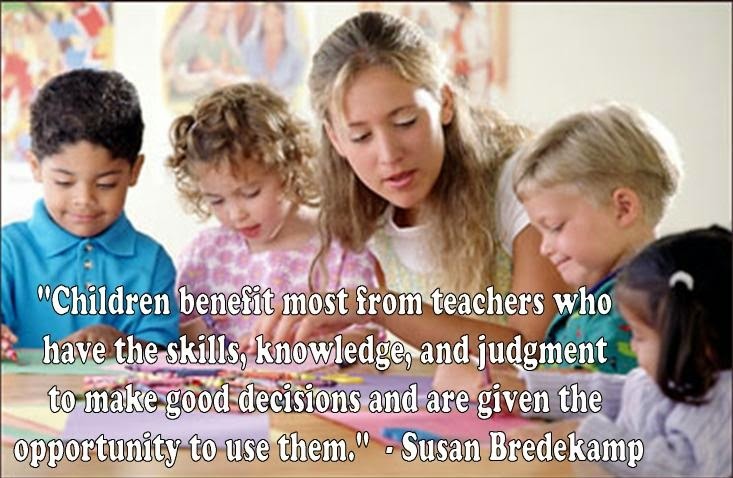 As Susan stated children learn from decisions that teachers are allowed to make, but they must have the opportunity. I chose the same to individuals for my post this week. I really like the quote from Susan Bredekamp as there are so many times teachers are made to feel trapped by stringent lesson plans and what they can and cannot teach their students. I have found this to be true even at the preschool level and get very frustrated by it. We have guidelines of what we should focus on teaching them each month and what they should know at the end of the class and are criticized if we do not strictly follow it. I had a situation where the kids were asking me to write their names on a chalkboard, along with drawing hearts, stars, etc. The director of the school was watching through the window and said to me “I certainly hope you are not teaching them to write their names. That is not on the lesson plan and not your responsibility. You need to leave that for a later class.” Not only was I insulted by her comment as I was doing the writing and obviously not teaching them to write their names, but kind blown away that I am not “allowed” to teach certain things. I understand not overwhelming the kids with too much, but sometimes they truly go overboard. I really, really like the quote from Lilian Katz. I had never thought of that before. It’s so amazing, simple but true. I think that this might be where tough love could come into play. Of course children’s need encouragement but I do realize, now that I think of it that sometimes adults overdo it. When they do children tend to go in the wrong direction with all the praise. Great quote.